Today, my new book Learning PowerCLI – Second Edition was published by Packt. 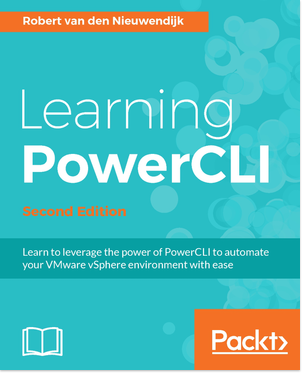 Learning PowerCLI, Second Edition will learn you to leverage the power of PowerCLI to automate your VMware vSphere environment with ease. Starting with an introduction to the basics of PowerCLI, the book will teach you how to manage your vSphere and vCloud infrastructure from the command line. To help you manage a vSphere host overall, you will learn how to manage vSphere ESXi hosts, and deploy and upgrade ESXi hosts using Image Builder and Auto Deploy. The upcoming chapters will not only teach you how to create datastores and datastore clusters, but you’ll also work with profile-driven and policy-based storage to manage your storage. To create a disaster recovery solution and retrieve information from vRealize Operations, you will learn how to use Site Recovery Manager and vRealize Operations respectively. Towards the end, you’ll see how to use the REST APIs from PowerShell to manage NSX and vRealize Automation and create patch baselines, scan hosts against the baselines for missing patches, and remediate hosts. By the end of the book, you will be capable of using the best tool to automate the management and configuration of VMware vSphere. VMware Onyx has been a very popular fling for many years. You can use Onyx to create PowerCLI code by performing actions in the VMware vSphere client. The created PowerCLI code does exactly what you did in the client. The PowerCLI code can easily be adapted to your own needs. Some of you may have noticed that I have not been blogging very much lately. This is because I am now writing my first book “Learning PowerCLI”. This book is aimed at beginning and advanced PowerCLI users and will help you to automate your VMware vSphere environment including hosts, clusters, storage, virtual machines, networks and vCenter Server. The book teaches you how to use old and new VMware vSphere features like Datastore Clusters, the vSphere Distributed Switch, Host Profiles, Image Builder and Autodeploy, Storage I/O Control and much more using PowerCLI. The expected release date of the “Learning PowerCLI” book is November 2013. 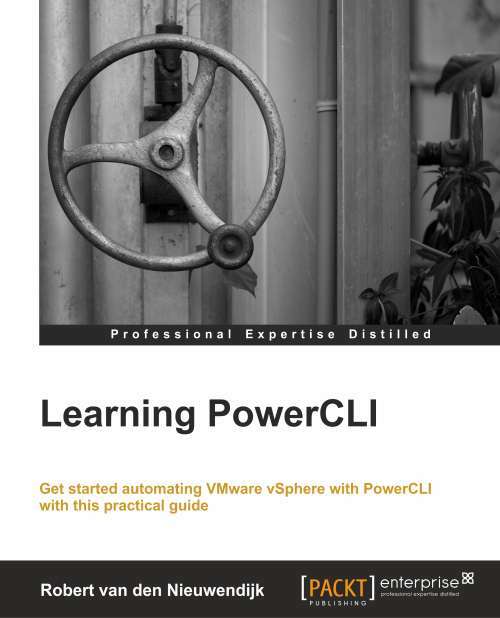 The “Learning PowerCLI” book is available for pre-order at http://www.packtpub.com/learning-powercli/book. Thanks for all you do. The vExpert Program is going to be great this year. Keep on rocking! Many thanks to Alex and John Mark Troyer, who started the vExpert program three years ago. I am proud to be part of the VMware vExperts. And I look forward to work with VMware and the other vExperts more closely. Congratulations to all the other vExperts 2012! More information about the VMware vExpert program can be found at the vExpert Directory.